Heat oven to 375°F. In large bowl, stir cookie mix, flour, melted butter and egg until soft dough forms. On floured surface, roll dough 1/4 inch thick. 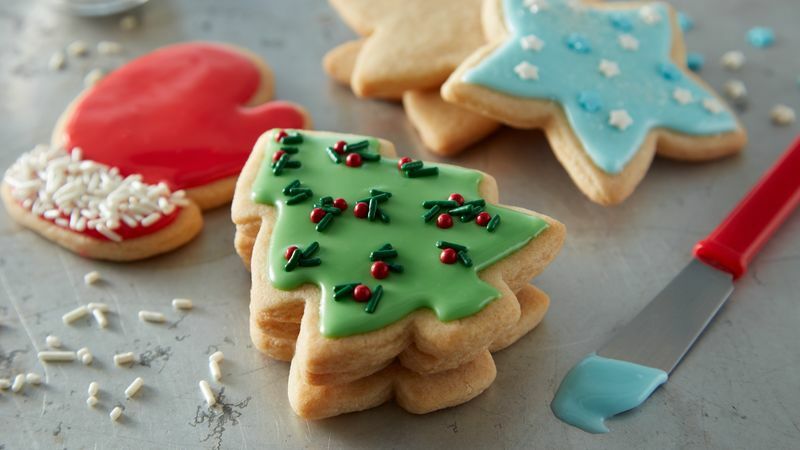 Cut into desired shapes with 3-inch cookie cutters. On ungreased cookie sheets, place cutouts 2 inches apart. In medium bowl, beat powdered sugar, 2 to 4 tablespoons milk and the vanilla with spoon until smooth and spreadable. If frosting is too stiff to spread, add additional milk, 1 teaspoon at a time. Tint with food color. Spread frosting on cooled cookies. Decorate as desired with candy sprinkles and colored sugars. Let stand about 30 minutes or until frosting is set. Store covered in airtight container at room temperature with waxed paper between layers. If using 21-oz pouch Betty Crocker™ sugar cookie mix, make dough as directed on pouch for cutout cookies. For Frosting, use 2 3/4 cups powdered sugar, 3 to 5 tablespoons milk and 1/4 teaspoon vanilla. Makes 32 cookies. Cut cookies with a cutter dipped in flour. Cutting shapes as close together as possible on the rolled dough helps you avoid rerolling the dough scraps (rerolled dough will be a little tougher).